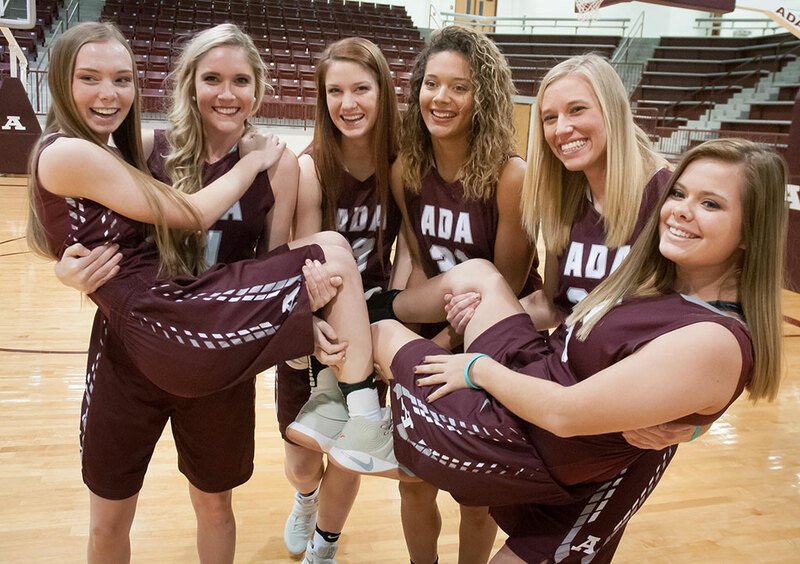 The Ada Lady Cougar senior basketball players pose for their “we’re tough” picture at media day. The booster club ended up using this image for a banner they hung at the Cougar Activity Center. 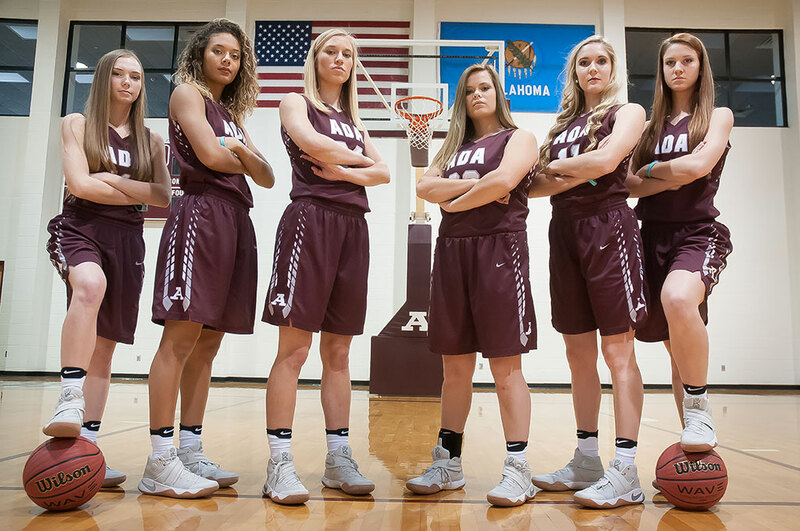 From left to right are Kaitlyn “Katy” Redman, Madalyn Jessepe, Aleli Thomsen, Bree Willis, McKenzie Dean, and Payton Taylor. As I have noted a time or two in the past, time flies. This is especially the case for me now that I am married and happy and having fun. It seems like yesterday when we gathered at the Ada Cougar Activity Center on November 29 for this season’s Ada basketball media day. Then yesterday, just like that, it’s senior night, the last home game of the regular season. 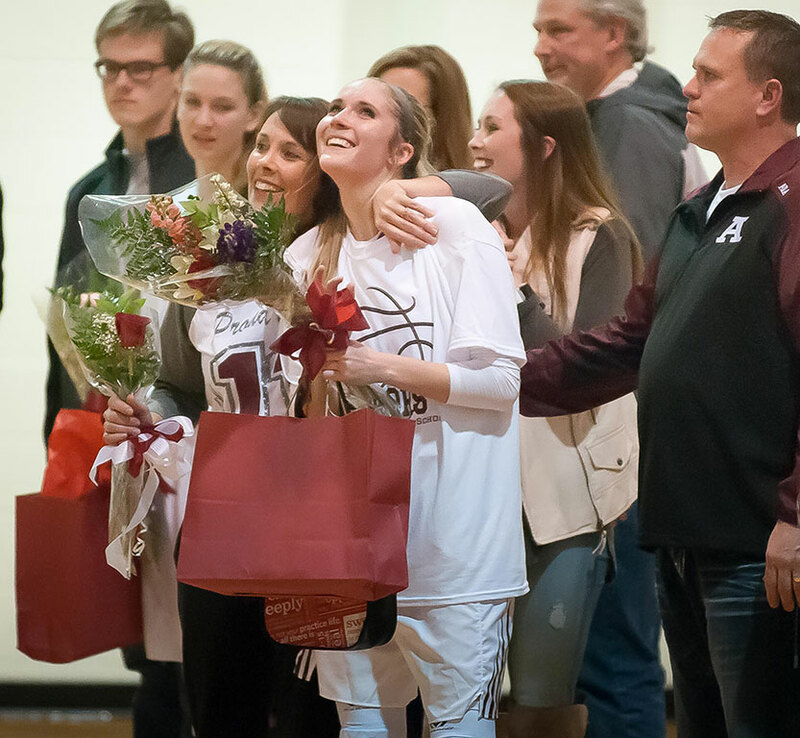 McKenzie Dean was one of the senior players honored last night. She is pictured with her parents, Angie and Steve Dean, and her sister Haley Dean. I have been photographing the Deans for most of my career. 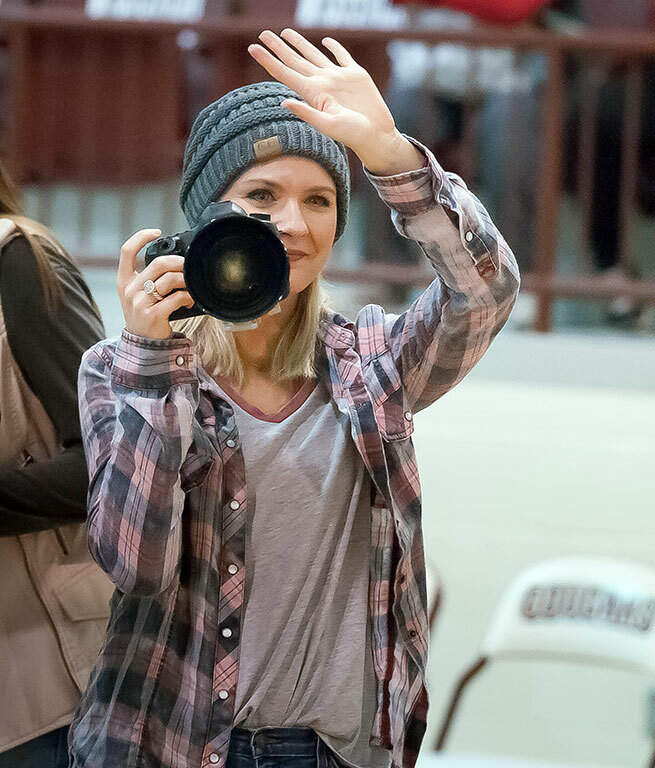 My friend and fellow professional photographer Courtney Morehead shot this image of me recently at the Cougar Activity Center. On either side of me are the pictures I made of the seniors at media day in November which the booster club printed large. It was at media day that this story happened. My sports editor and I were gathering the usual stuff – team photos, head shots, senior poses – and having fun doing it. 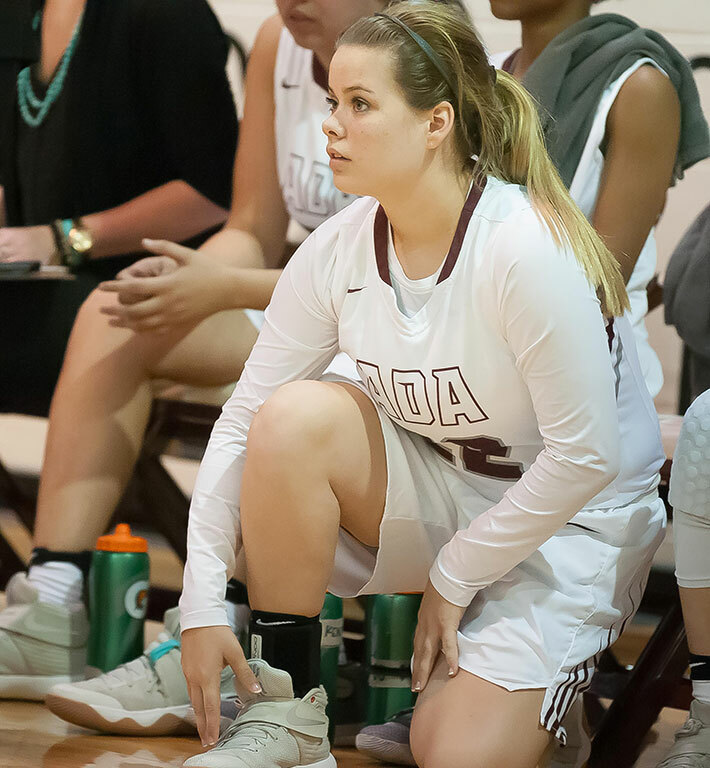 Ada senior Bree Willis watches a recent game from the sideline. It was her shot at media day that amazed us all. I had assembled the Lady Cougars for their team shot near half court facing away from the nearest goal. Bree Willis, one of the seniors, happened to be holding a basketball. “What do you want me to do with this?” she asked. The next day Bree saw me at the school on an unrelated assignment and told me she taped that dollar inside her locker. As the years go by, it seems like I have more fun and enjoy my job more than ever, and it shows in my work. Pictured are Kaitlyn “Katy” Redman, McKenzie Dean, Payton Taylor, Madalyn Jessepe, Aleli Thomsen, and Bree Willis. Fun times indeed Richard. Fun times. Time has passed too fast. Can’t believe Kenz is a senior. Thanks for capturing so many memories. On that first image, if you’d leaned 3 inches to the right, Payton would be going viral as the one-legged Lady Cougar balancing on a basketball. Still, it made me look.